This is a little different from my usual style, but not so far out there that I’d never wear it. 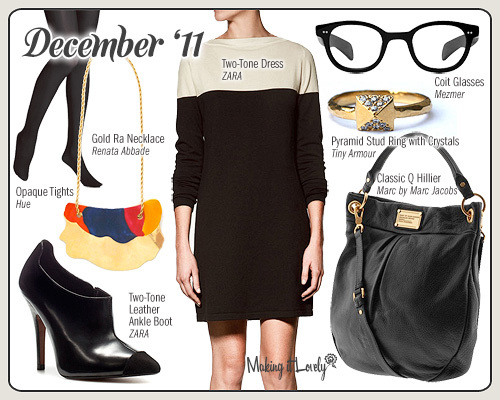 I love the dress with black tights, and that bag has been on my wish list for a while now. The glasses are awesome, the necklace is bold but not crazy (sometimes I like ’em a little crazy), and the ring is just plain cool. I think it’s the ankle boots that are pushing me out of my comfort zone with this outfit. What about you — would you wear this? Or maybe with some substitutions? Yikes, looks like it’s sold out already! how do you guys feel about black tights with peep toe booties/heels? I want to hear what other people say too! I’ve seen it on other people and it looks all right, but I feel weird about doing it myself. I love tights and knee socks with peep toe or even sandals. My hardest thing is finding tights that fit but don’t slide down and bunch at the ankles. I used to love Spanx reversible, but I just dropped $34 on a pair that according to their size chart I fit perfectly in and they slid down all day! (‘cuz yanking at tights all day is sooo ladylike). what brands to people like? I love the bag, but not the price! Anything more affordable, but similar? Amanda — what about this bag? Looks sort of similar (minus the pretty gold details) and a good price too! You totally nailed it! That bag! Those glasses! THE RING! 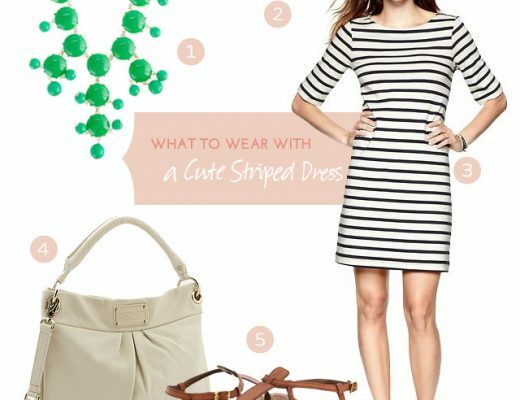 Love this style post – more “me” than some, but I always appreciate seeing how well you put things together. I would totally wear it. I love those boots but would never wear them with that outfit. Boots like that with skirts make my legs look fat. With pants or jeans, I think they would be super cool. I LOVE this outfit. I know you aren’t sure about the booties, but I think they are smokin’ hot! Perfect outfit for holiday parties. I think I would admire the boots on someone else, but would be scared to wear them myself. But I think the outfit is awesome!! I wanted to add that if you have bigger calves but a thin ankle area, those boots really help elongate the leg. I have to stay away from most boots because the width of the ankle area makes my whole leg look like a tree stump. I’d stick to my tall black flat boots. I like the opaque hose w/peep toes (esp. bright hose). I’ve been swooning over that Marc Jacobs bag all year! Girl! This outfit is amazing. I want everything on this list. I absolutely love your style. I’m going to keep this (and your style inspirations in general) in mind when I’m shopping. Love it! I’ve been hunting unsuccessfully for flat riding-style boots that aren’t too loose in the calves (boo hoo – all the Frye boots that I tried were too big) and am thinking I should try booties instead. Of course they aren’t flats, but they’re sooo cute! Thanks for the ideas! Did you know that you can take boots to the shoe repair place and have them cut down to fiit in the calf? have the opposite problem as you- most boot calves are too small, but either way, a good shoe guy is a god send. I rarely comment, but I LOVE this style post! I have been at home with my three-month old and sometimes feel like I don’t remember what kind of style I like, but this is very close. Thanks for sharing! I just ordered the Zara boots – fingers crossed that they look as amazing in person!